Peter Maes & Stefaan van Biesen [2009 > 2018]. 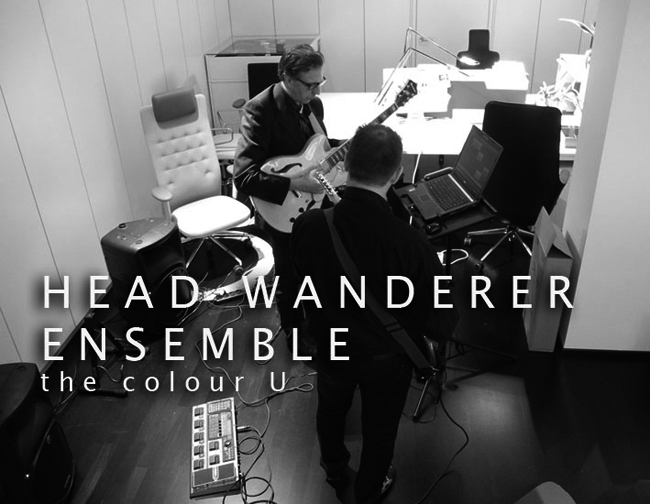 For some time Peter Maes and Stefaan van Biesen worked on the colour U and Head Wanderer Ensemble project [2009-2018]. Live perfomances for art projects. Making sound compositions as a musical layer to perform live. The 'Head Wanderer Ensemble' is a more experimental phase, a mix of classical music and electro. Travel Notes [Head Wanderer Ensemble]. 2018. The new Band Camp release of 'Travel Notes' by Head Wanderer Ensemble (Peter Maes & Stefaan van Biesen aka China Blue, the Color U). A full CD with instrumental compositions inspired by different walks in Europe: Nicosia, Berlin, Paris, Edinburgh, Leipzig , Lissabon ... a mix of electronics and electric / acoustic guitars with field recordings in different cities during walks. 01. My Metropolitan [Berlin Walk] [03:38]	> 0 2. Urban Flaneur [a red red rose] [03:36]	> 03. Crossing the Green Line [Nicosia Tales] [03:58]	> 04. Look at the Clouds [Edinburgh Leith Walk] [03:34]	> 05. Magique [midnight Paris walk] [04:36]	> 06. Checkpoints [Ledras Street / Nicosia Tales] [05:48]	> 07. Der Wanderer [Leipzig summer walk] [04:20]	> 08. Skyline Memories [Deirdre & William Scale walk] [04:40]	> 09. Rosario [applauding the rain] [04:38]	> 10. Stella [Western Wind] [03:51]	>11. Veronika [slow walk] [03:48]	>12. Sideways [J' Adore] [04:33]	> 13. Nightfall [nocturne] [03:50]	> 14. Largo da Graça [Lisboa in reverse] [02:29]. the Dresden Suite [Head Wanderer]. 2011 [Live performance - Total time: 20:43]. Video is an adaptation of the live performance at DACCA Belgium for the art project METAforen 28.08.2011. Starting from a rock setting, their music has evolved to a more eclectic form, [a crossover], where all kinds of influences, from the classical avant-garde to alternative rock, have melted into one specific sound. Having opted for the guitar as their instrument, they use a computer, sampling, keyboards and digital recordings of their surroundings to further their creation of a sound landscape of their own. In this way, they give music a more visual dimension. Inevitably, this has resulted into a series of compositions, written especially for video and art exhibitions. É T U D E S [ F O R . 2 . E L E C T R I C . G U I T A R S ] . 2009. [Études for 2 electric guitars]. Electronica +2 treated guitars and keyboards. A mix of improvisation, self made samples and home computer production. [Peter Maes & Stefaan van Biesen]. 01. Étude 1 [02:58]	> 02. Étude 2 [03:38]	> 03. Étude 3 [View] [03:53]	> 04. Étude 4 [Syd] [03:46]	> 05. Étude 5 [Passio] [06:23]	> 06. Étude 7 [03:24]	> 07. Étude 8 [Lizard] [01:53]	> 08. Étude 9 [Sensation] [04:13]	> 09. Étude 10 [Open Space] [02:35]	> 10. Étude 11 [Symphonia] [02:56]	> 11. Étude 12 [Urbania] [03:19]	> 12. Rain & Whispers [03:34]	> 13. Étude 13 [Charis Garden] [05:36]. The Listening City  Live performance. Live performance by the colour U at STeM Sint-Niklaas Belgium. 09.05.2013. European city sound workshop and event with noTours and WIT Urban Team in Sint-Niklaas. Via participation of the residents and contributions of the European visitors the project will focus on an aural experience of the city and on the creation of a soundwalk with an alternative and creative tour of the city. Working [A Working Man Song] [version]. Midsummernight's Dream [live recording] 2007.